When I was a child, we practically lived in the arcade, playing pinball. It was the one place my brother and I could agree on -- and get along. But life happens, you grow up, and you find other hobbies (like travel). And more than a decade passed since I had last touched a pinball machine. Then I found myself in Budapest at the Flipper Museum, an interactive pinball exhibit. I excitedly entered the space. The blinking lights, the clinking sounds, the focus in the players' eyes as they were completey immersed in the moment... the nostalgia. I was in a foreign country and felt completely at home. Just like that I was hooked again, remembering how fun it is to play. Perhaps you think of the game as retro, and truly its heyday was the '70s, but pinball is still alive and well today. You will find machines with newer themes such as Game of Thrones and The Walking Dead right alongside classics. Other than TV shows, you'll find machines that display your favorite bands, movies, games, and more obscure topics. So, where can you find machines? Usually not at shiny, new places. You've gotta look in old-school arcades (or even pinball museums) and less obvious spots like laundromats, bars, and highway rest stops. + Don't hit both flippers at the same time. The space between them will be bigger if you do and it's easier to lose the ball. + Cradle the ball. Pinball is a fast-paced game, if you catch the ball you have the ability to slow it down and strategize. + Tilt, nudge, shake -- but not too much. If done with finesse, you can save your ball. If done recklessly, you'll lose control of the flippers. + Follow the rules. Many machines will tell you where to shoot the ball so you can get a higher score. One machine: Addam's Family. Also a great place to grab a beer and some pub food, maybe before a show at the Palace Theatre. One machine: Monster Bash. You will also find the Tekken arcade game, seriously good fried chicken, and sometimes live music. One machine: Monopoly. Plus skeeball, foosball, arcade games, and a great bar scene. On a summer vacation there is nothing better than a dip in the lake, a cream soda at A&W -- and a trip to the arcade. Along with the rest of the classic games, there are nine pinball machines. It would be worth it for a pinball fan just to drive up for the day to play! A little seedy, but a whole lot of fun. In an unassuming locale, this places includes one part rock music/memorabilia, one part smoke shop, and one part pinball room. Pass through the hallway with the black light psychedelic posters, jam out to some tunes, and enjoy playing on more than 20 machines. I love the electric colors and lights on the walls and the 26 pinball machines don't hurt either. Plus you'll find a bonus of more than 100 arcade games. No matter what game or era is your favorite, there are gems such as 1978 Space Invaders, 1984 Duck Hunt, 1991 Simpsons, all the way up to a brand new 2016 Medieval Madness Remake pinball. An adjacent store sells video games. If you plan on making it out to Binghamton, you should really take the 15 minute drive for some more fun. There are over a dozen pinball machines, many of them from more recent years, along with a few arcade games, pool tables, and air hockey. It's predominantly a gaming store with a few pinball machines and arcade games in the back. There are also tables for playing games. On the day we visited there was a Magic: The Gathering tournament in progress. If you're looking for more fun while you're in the Syracuse area, there is a mini-golf course which has a pinball machine themed hole! While most games have tokens or quarters, some spots you pay general admission or an hourly rate (in this case $12 an hour). These are my favorite because I am definitely not a pinball wizard, and I can get a whole lot more pinball for my buck. There are more than 20 pristine pinball machines including The Who's Tommy. If you plan on going back again and again, inquire about their punch card. In this generation, who doesn't love multitasking? Do your laundry. Drink a beer. Play some pinball! There are plenty of machines of all kinds. Open daily, early, and late. If you are cruising along I-90 in Massachusetts, break up your trip by stopping to play pinball! 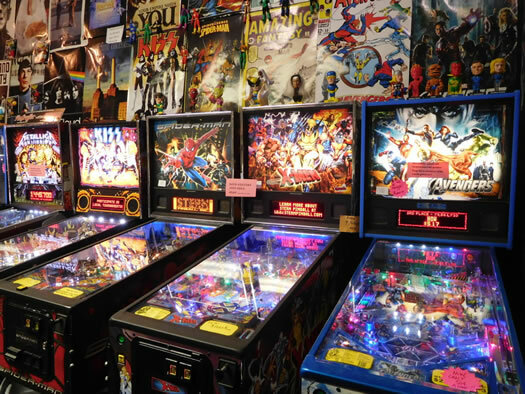 Located in a strip mall in a quiet town there are more than 100 pinball machines (including many classics from the early 70s), nearly 200 arcade games, plus pool tables and other games. You could spend hours and not play through everything here! If you plan on staying awhile, be sure to buy $20-worth of tokens because you'll get a discount. 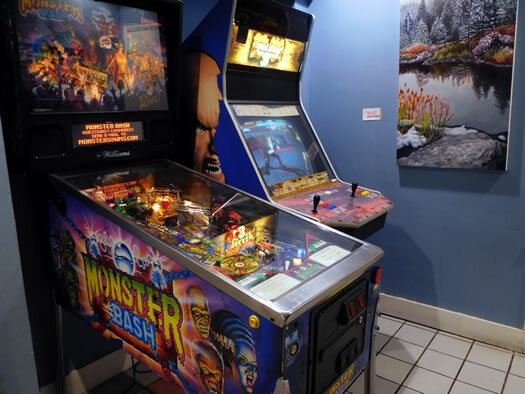 Looking for more pinball in New Hampshire? You'll find it nestled among rides, bumper cars, bowling, mini-golf, bingo, and more at what's said to be the largest arcade in the world! A great beach town complete with boardwalk, the Stone Pony music venue, some great food options (try the Speakeatery), and best of all, pinball! Step off the beach and into the arcade. There are half-hourly, hourly, all day, afternoon, and evening rates. You'll find older machines from the 1930s to present day. I love how each individual machine is tagged with a blurb telling the year they came out and a bit of history. This is not a comprehensive list. So, know of more places located around the Northeast (or around the world) worth mentioning? Please share! Julie has got the travel-bug. Whether it's day trips, weekend getaways, or wandering around the world -- she's always up to something. Read more about her adventures at juliejourneys.com. 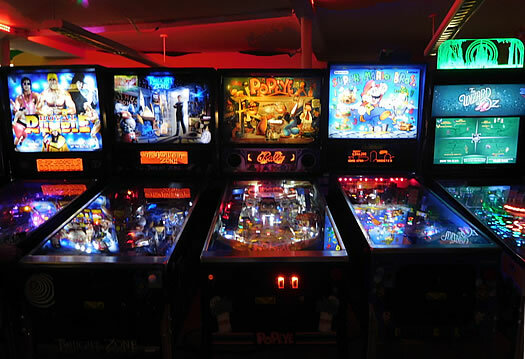 A bit further out of the way but you asked for it: Games N'at (it's a western PA thing) in Pittsburgh is another flat fee arcade with pinball, and it's BYOB (which also gets a little complicated in PA). They even have cupholders on the pinball machines. It's been a while since I've ventured out that way, but Pitt makes a good weekend trip with the Warhol Museum, the Carnegie, the Frick, the zoo, the Phipps, the stadium if you're unfortunate enough to be a Pirates fan, and even a funicular. Last I was there was almost five years ago but I was really impressed with the options for food too, spent a long afternoon in a divey-feeling bar in the corner of Market Square. Would love an excuse to go back for a couple days. I actually have a Flash pinball game that needs to be serviced, as it started to smoke last time it was turned on. Any ideas who to call that will come to my home? 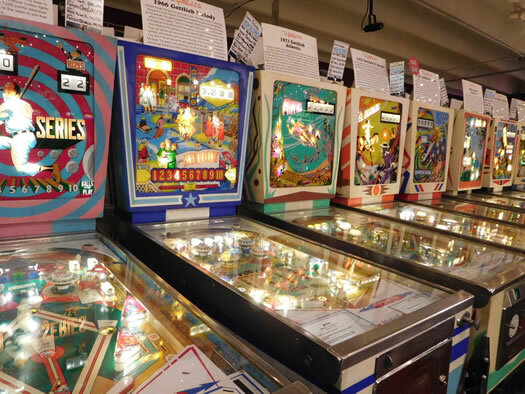 Since you went to Jersey anyway, there's a place a few miles west of Valley Forge, say 35 miles west of Philly, that has about a dozen pinball tables and league play. 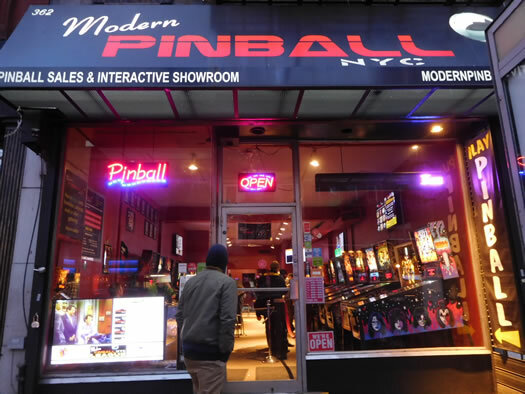 Not far from me at all, but I haven't been there yet because I'm afraid of falling into the black hole of pinball (again). This post made me grin ear to ear. Awesome article - great to know about Fun World Arcade in Lake George. Definitely will try to make it over the holiday weekend. When I am lucky enough to get to NYC I visit Sunshine Laundromat. Totally insane and the absolute greatest games+condition anywhere - NYS and beyond. Peter is the best in the business. Silverball in NJ is fantastic in the winter. Go during the off season when they have time to fix up the machines plus you have free reign of the entire place. 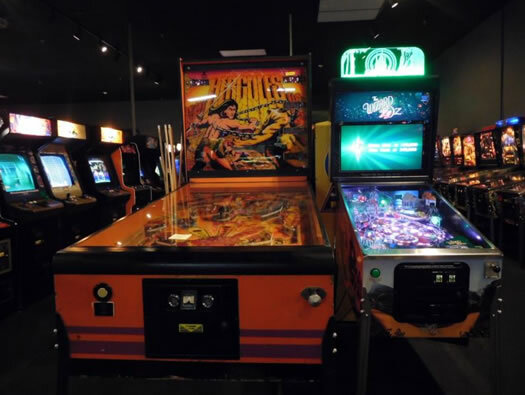 Pinball Wizard is a must visit too. Sarah is super passionate. If you're in Maine check Arcadia. Dave is a great guy! Put myself through high school fixing pinball machines and arcade games. Was the best job ever. There used to be a good sized arcade at Sylvan Beach next door to the SkiBall arcade. @llcwine, the editors can put you in touch with me and I'll see if I can help at all. Farmington Hills, Michigan (metro Detroit) and if you go, a stop at Greene's Hamburgers for a slider is a must. Back to Marvin's. 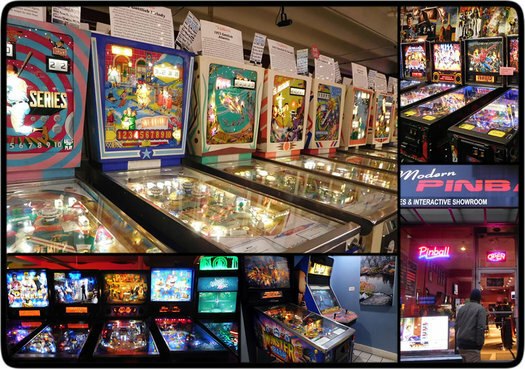 "The largest collection of well kept pinball machines in the area. Every decade accounted for." And it makes me wonder: What happened to the amazing Dolly Parton pinball machine that was at the old Palais Royale? Is it still there? I have fond memories of that machine! We apparently have a league here now.